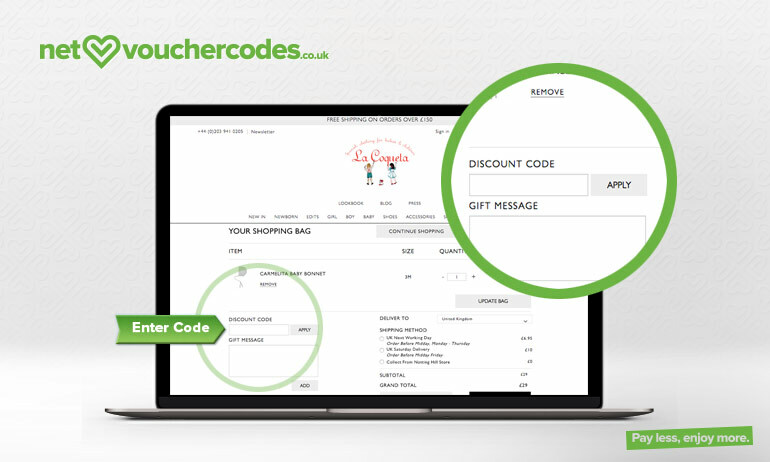 Where do I use my La Coqueta voucher code? The kids clothing and shoes available at La Coqueta are beautifully made, functional and hard-wearing. Every garment's origin can be traced back to a Spanish family run business that uses the finest materials and craftsmanship to produce stylish and practical fashion, footwear and accessories. Shop for newborn girls and boys products and gifts as well as dresses, shirts and tops, knitwear, shorts, skirts and trousers, nightwear, coats and jackets and swimwear. For babies, there’s romper suits and sets as well as shorts, trousers and dungarees. Pair your little one’s outfit with shoes and browse through the collection of adorable accessories including bags, belts, braces, bows, hair bands, socks, tights, hats, scarves, blankets and booties. You can also shop via the ‘new in section’ to find the latest pieces from La Coqueta or via the ‘Edit’ category. In the edit section you’ll find dreamy nights, new romance, flower power, SS18 print guide, step out in style and perfect layers collections, there’s also a special occasion section where you can find outfits for every occasion your little one may attend. For inspiration and help on what to buy take a look at the lookbook section or the blog where you’ll find great style tips and trend advice for your children. The print guide available in the edit section displays all the latest on-trend prints that you’ll see on many of the new in clothing on the La Coqueta website. From bold florals to sherbet shades and glorious gingham, La Coqueta has a print that is perfect for any occasion and season. Every year the print guide is updated to show you the newest and most on-trend prints and patterns so you know exactly what’s fashionable for your little one in the world of kids fashion. Having a baby is an exciting time for anyone, especially when it comes to picking out cute baby wear. Newborns tend to grow out of their clothing fast which is why La Coqueta always strive to produce stylish, appropriate, high-quality pieces such as baby grows and rompers while keeping prices affordable and great value. 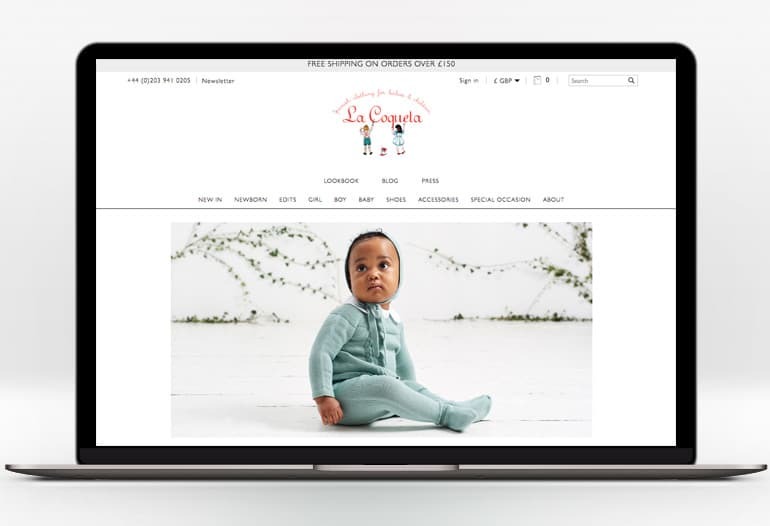 In the newborn section on the La Coqueta website, you can shop in both the boys and girls section where you’ll find sweet sage, lemon yellow, dusty pink and nautical stripe clothing, all proudly made in Spain. If you know someone who’s having a baby you can also use the La Coqueta newborn section to find gifts. There are items such as bonnets, blankets and booties available all in different colours, all beautifully made with the finest materials, suitable for every baby. For those special occasions spent with family and friends where we like to dress up in our very best, it’s important that our kids look smart and appropriate too. At La Coqueta you’ll find stunning occasion clothing for babies and younger girls and boys, all of which is age appropriate, adorable and smart. 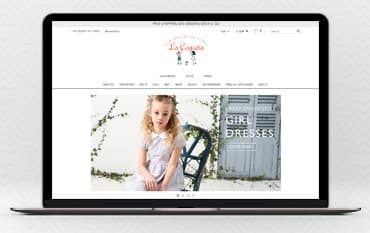 Whether it be soft plummetti dresses finished with fine French lace or smart crisp shirts paired with dungarees, La Coqueta has your little one covered for all special occasions whether it be weddings, christenings, birthdays or anything else. In the event that you are not completely satisfied with your order, La Coqueta will be happy to offer you a full refund if the order is returned within 14 days. Item(s) must be in a new and unworn condition with all packaging and garment tags still attached. This excludes hosiery and hair accessories. La Coqueta is a leading designer fashion brand for babies and children aged 0 months to 10 years, founded in 2013. Every piece of clothing is “Proudly made in Spain” with the highest quality Spanish craftsmanship. Shop for newborn products, everyday clothing, swimwear and nightwear for girls for boys as well as accessories and occasion wear. Shop online with a La Coqueta discount code from us and enjoy great savings on your order too.